We were drinking coffee and watching birds work in the orchard and what we could see of the side yard. We climbed the stairs to the second floor “tower” and sat in the bay window on the south side of the house. The bay window offered a perfect viewpoint for all the action. A woodpecker had drilled a hole in the outside wall next to the bay window and the empty cavity attracted a pair of Starlings. When the female began to carry nest materials to the hole, Erica tried to discourage her by rapping on the window and yelling “NO!! !” Then, realizing her voice was about to fail, she decided to use a referee’s whistle. A shrill blast from the whistle proved to be more effective than yelling, but the Starlings were persistent. A power pole about 30 feet from the house made an excellent observation post for the Starlings… they would perch innocently on the top of the pole. We could see them fluff their feathers and preen, pretending to be absorbed in grooming, but carefully looking around. When they were satisfied the route was clear, one would launch toward the woodpecker hole and the cycle would begin again. Erica would greet the Starling with a blast from her whistle . 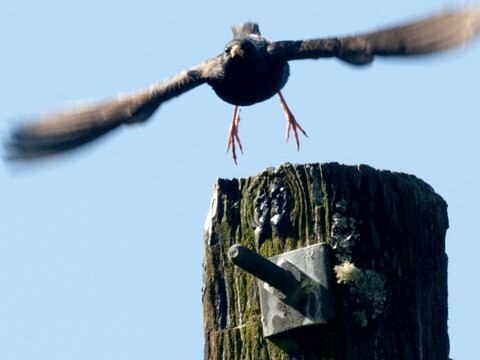 . . the Starling would flee… and return a few minutes later. It remains to be seen who will persevere, Erica or the Starlings. “Let’s see what we can find on Google,” I replied. 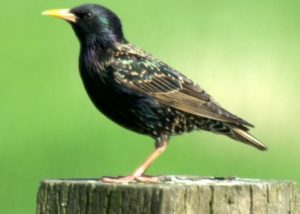 According to Wikipedia, the Starling is not native to North America and was introduced by humans, so they are not protected by the Migratory Bird Treaty Act. The Starling is shotgun fodder. There was no room to disagree. It was time to change the subject. Paper IS a Renewable Product . . .